Boarding Over the Kitchen Ceiling! So you've seen our new kitchen walls and you've also seen our recent roof addition, the Velux window (still LOVE IT!). Today I'm sharing our new ceiling! It's not that exciting, I admit. But when you're renovating, every small step towards the end makes a huge impact to the room and the tunnel gets shorter and shorter. And for that, I'm excited! So, the reason we're over-boarding the ceiling is because of that hole in the middle of the room where the old wall used to be separating what used to be a shower room and kitchen. We had intended to just patch the hole, which makes so much more sense - until we realised the ceiling either side of the hole were considerably different heights. In fact, I took a spirit level to the ceiling and the whole ceiling was completely wibbly wobbly throughout. Not a perfectly flat surface anywhere! But the height change in this small gap would have been really quite noticeable. We could have enlarged the hole and replaced a larger section of the ceiling (a slope over a large surface are is far less noticeable!) but then we'd have to deal with a hell load of fibreglass coming down on top of us along with black dust, jagged bits of slate and whatever else is now resting on the top of the plasterboard in the attic space - as we soon discovered when we cut out the hole for the roof window. By overboarding the ceiling, we'd minimise all that dust, save our lungs and it'd actually be a whole lot less work too. Cutting plasterboard, de-nailing the joists and cleaning up mess takes more time than you would think. 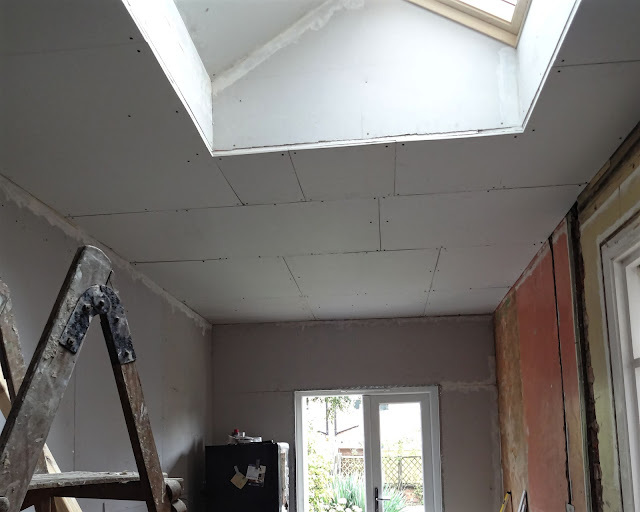 Adding another layer of plasterboard also adds extra fire protection to our ceiling, which is GREAT news as we don't have a firewall in the attic space between us and the neighbour. This means fire could much easier between both our houses. Being a kitchen, this is pretty concerning. Doubling up on plasterboard is the same as using fireproof plasterboard, so that's a real added bonus. Of course it's not the same as a fire wall, but it's does add something. And of course, another layer of plasterboard reduces the amount of sound travelling across to our neighbours too! Of course, the negative to over-boarding the ceiling, is that yes it is an extra cost. But one that doesn't hugely break the bank. And the ceiling height will be slightly lowered too. But, I mean who's going to notice 1cm gone? So, here's a quick look at the room before - you can see where the two different rooms were by the hole and the fact the ceiling is two separate colours. And there's also a couple of access holes which we made waaaaaay back two years ago for re-routing the bathroom plumbing. We started boarding in the far corner of the room, using our nifty prop tool which we created a couple of years back when we did the bathroom ceiling. Lifting plasterboard is very heavy, and if you don't have an expensive plasterboard lifting tool or two extra hands, this is a great way to wedge plasterboard into place whilst screwing it into position. When over-boarding a ceiling, it can be hard to know where the joists are to screw into as they're obviously not on show! If your joists are evenly apart then this obviously helps - but if not, then it can be a total guessing game! However, if you have a magnet, you can use that as a tool for finding hidden screws and nails as the magnet will be attracted to them, even plastered over. It's not always that easy or sometimes possible when screws aren't magnetic or are set too far into the material - but if it works, it works a treat! We staggered the plasterboard as went around the room, so the joins are in a brick-like fashion. This helps prevent cracking. And we also used quite long drywall screws as we're going through two layers of plasterboard before hitting the wooden joist. It was pretty easy to do and took less than a full days work, but oh my - has it made such a difference?! This is probably the first time this room has ever felt like one single room and not two. The hole in the ceiling is completely gone and the two separate colours are now one! There's no obvious slope in the room - the ceiling obviously isn't perfectly straight and clearly never was, even as two separate rooms (I guess that's old houses!) but it's nothing noticeable. You would literally never know! It's also given us a really good indication of how the ceiling will look as a finished whole piece with the window in it. I actually think the window now looks like more of a feature in this room, and it looks a lot more like it's meant to be there. It's also made me realise that I don't want fussy feature lighting, I do want to the roof window to be its own feature within the ceiling. We had initially planned for two pendant lights in the centre of the room, but this how now changed and I definitely want a streamlined ceiling. We have left one tiny section without plasterboard which gives us access into the attic space - as we're not quite ready to close it off yet... There's still unfinished business up there. But for the most part, it looks great!! I remember this stage when doing up my house when you felt that a box was starting to become a room which you might get back at some point. It's really exciting. Bet you can't wait til you're done.